Thanksgiving Leftover Stuffing Muffins are made in minutes with leftover stuffing and turkey for a tasty breakfast or snack that you can dip in cranberry sauce or gravy! This post is sponsored by Tillamook. All opinions provided are my own. Thanks for supporting me in working with brands I love to bring you new recipes! One of the best parts about Thanksgiving is all of the leftovers! However, reheating the same dishes the same way for days on end can get a little old. That’s why I’m sharing a fun yet super simple Thanskgiving leftover recipe with you! I was actually challenged to come up with a creative way to use up Thanksgiving leftovers by my favorite dairy brand, Tillamook. They’re teaming up with No Kid Hungry to reduce food waste by turning leftovers into something delicious! The best part? YOU can easily get involved and help raise money! For every photo of a leftover dish posted to social media with #LoveWhatsLeftover and @Tillamook between November 23rd – 27th, Tillamook will donate $100 (!) to No Kid Hungry. How cool is that? It’s just another reason why I adore the folks over at Tillamook. I can’t wait to see your fun ideas for using up leftovers! 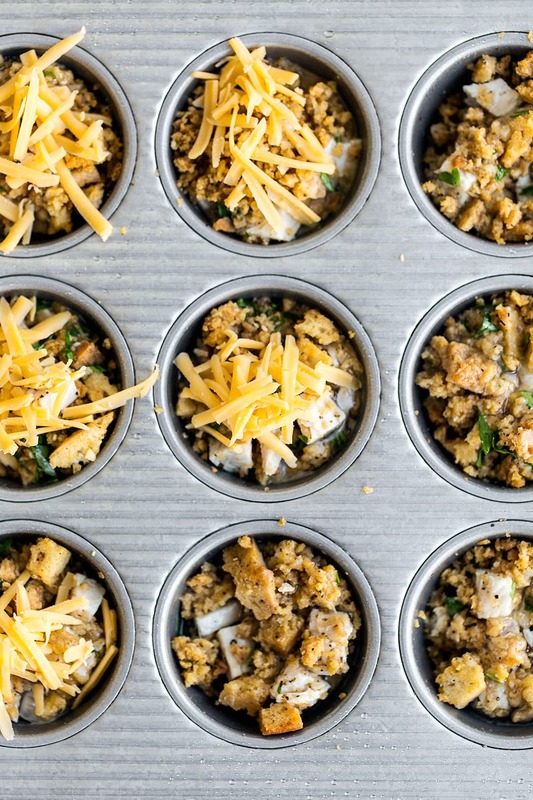 If you decide to make these Leftover Stuffing Muffins, feel free to get creative. The recipe is pretty adaptable and forgiving! You can add in some leftover mashed potatoes if you’d like – the result will be denser but delicious. 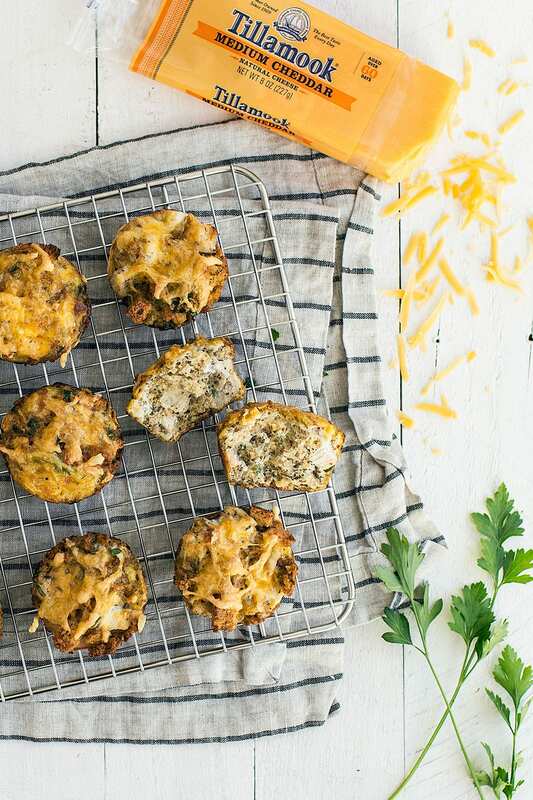 If you have any leftover Thanksgiving stuffing made with sausage, that’s particularly great in these muffins. Leftover ham works wonderfully in place of turkey too. 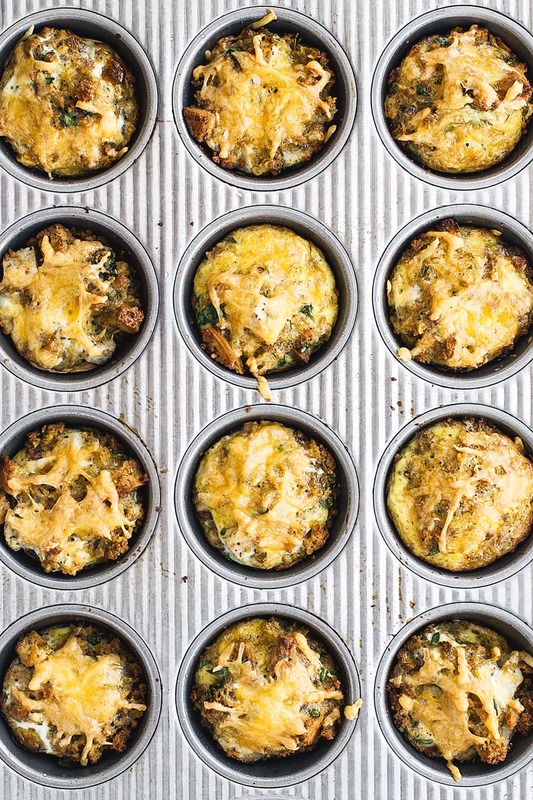 Also, you could toss in leftover cooked veggies for an extra boost of nutrition (this will likely increase the serving size so you may need two muffin tins). Whatever you do, just make sure your leftover stuffing isn’t too dry. If it is, add a splash of chicken or turkey stock. These muffins are particularly great served with any leftover cranberry sauce or turkey. However, I know with some families those might not last long enough for leftovers! 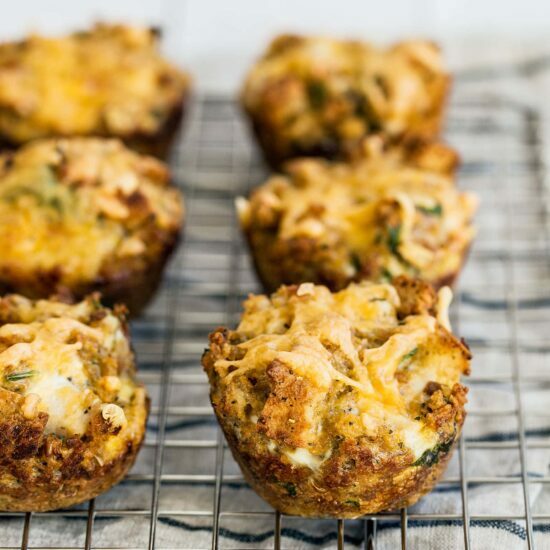 My favorite part of these muffins is definitely the shredded Tillamook Medium Cheddar Cheese on top. It gets melty and slightly browned as they bake and just takes everything to a whole new level of tastiness. For more #LoveWhatsLeftover inspiration, follow Tillamook on Instagram or Facebook to see more recipes and ideas. Preheat the oven to 375°F. Generously and thoroughly grease a standard muffin tin. Divide the stuffing and turkey between all 12 cups without packing in the mixture. In a medium bowl, whisk together the eggs, milk, salt, pepper, and parsley. Divide the egg mixture among the cups, filling each just over half full to give room for the muffins to expand as they bake. Sprinkle with the cheese. Bake the muffins for 25-30 minutes or until lightly golden brown and crispy on the top. Allow the muffins to cool slightly, then run a knife around the edges to loosen and remove each muffin. Serve warm or store in the fridge in an airtight container for up to 3 days. Reheat in the oven or microwave. *If your leftover stuffing is super dry, add in a splash of chicken or turkey stock to moisten. It should be moist but not soggy.